The D&D POWER DRIVE cogged banded belts are an excellent choice for virtually and application where increased horsepower capacity or output is needed. Or where conventional, single or multiple belt drives are impractical because of space or weight limitations. D&D’s banding process assures smoother, more quiet operations. The specially compounded wrap construction is ideal for clutching operations. And it won’t turno ver or jump off the drive. It’s oil and heat resistant and antistatic, too. 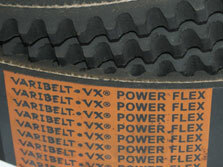 Typical applications for banded cogged V-Belts include vertical shaft drives, V-Flat drives and clutching drives. Cogged Banded V-Belts are recomended for use where belts vibrations or blet whip causes unsatisfactory results when conventional multiple V-belts are used.